In film circles, the phrase turns up constantly in the marketing of revivals: "new 4k restoration." New's good, right? Naturally. All new things must be good. Or, at any rate, new. Before we get into the weirdest movie Humphrey Bogart ever made, let's talk about that "4k restoration" phrase. Then we'll get into how it applies to the newly restored, eternally brazen 1953 oddity "Beat the Devil," opening June 30 at the Gene Siskel Film Center. "New 4k restoration" means a studio or an archive or a foundation has financed the cleanup and digital transfer of an existing movie. The restoration draws upon the best surviving elements of the film's original print negative, a duplicate negative and other materials. The goal is to assemble "the fullest and best version of what's available," says Sony Pictures Executive Vice President Grover Crisp, who oversees the company's asset management, film restoration and digital mastering. A 4k restoration refers to a horizontal screen resolution of approximately 4,000 pixels. The more pixels, the more complex the visual detail. The more complex the detail, the more you can appreciate the creases, contours and general fabulousness of Bogart's face, or the fabric of the suits his co-stars are wearing. A typical 4k restoration offers no new footage. It's simply the sharpest digital iteration of a movie available. Whether or not it represents the optimal viewing experience is a debate for another article; the warmth of celluloid versus the harder, arguably more clinical edge of high-def digital constitutes an ongoing aesthetic battle. Recent 4k restorations of "The Third Man" or "Taxi Driver" or "Blood Simple" bring out additional shadow detail and a heightened contrast in tones and hues. But in terms of the film itself, there's nothing NEW-new about them. Then there's "Beat the Devil," restored last year and currently making the rounds at the nation's art and specialty houses. It is a uniquely punch-drunk champion in the annals of rogue cinema. And thanks to the timely discovery of the film's uncensored international version in a London vault, contemporary curiosity-seekers are treated to four additional minutes of footage; a reordered narrative chronology; the removal of some really lazy voice-over narration spoken by Bogart; and a clearer, better, brighter visual palette than "Beat the Devil" has had in decades. "Only phonies like it," Bogart said. (His production company put up much of the money, and lost it.) The source was a 1949 book by Anglo-Scots journalist-turned-novelist Claud Cockburn, writing under the pseudonym James Helvick because of his Communist past. His story concerned a ragtag group of international swindlers colluding and colliding along the French Riviera. The ringleader is an American, Billy Dannreuther, whom Bogart played in the screen version. Director John Huston hated the screenplay he was stuck with. One week prior to filming on location, with all his actors lined up and ready, he nearly bailed. But David O. Selznick, the mogul husband of "Beat the Devil" co-star Jennifer Jones, suggested that a young writer named Truman Capote come to Ravello, near Naples, and take a whack at a rewrite. 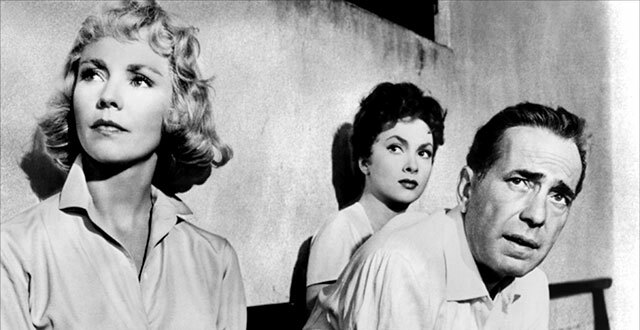 Along with Jones, the cast included Gina Lollobrigida as Billy's Anglophile wife; Robert Morley as one of the comical ruffians; Peter Lorre, his hair dyed to look like Capote's, as an ex-Nazi going by the name of O'Hara; and assorted other eccentrics. Much has been written about the way "Beat the Devil" came together, barely. Capote rewrote as fast as he could, every day. Huston devised elaborate camera setups to kill time while waiting for the script pages. The cast, other than Bogart, didn't realize the ruse. "John and I," Capote later said, referring to Huston, "decided to kid the story, to treat it as a parody." Co-star Jones, whose fabulist character speaks like an Oscar Wilde creation out of "The Importance of Being Earnest," never understood what her character was supposed to be thinking, or saying, or feeling. The plot, as recooked by Capote and Huston, moved the story's action (dominated by talk) from France to Italy. It focused on Bogart and company conspiring to sail to Africa to buy a uranium mine. In large part, "Beat the Devil" is a movie about a group of castoffs waiting for their boat to sail. The plot wasn't a plot; Capote himself called it "a so-called plot." The tone was peculiar, amusing to some, baffling to others. A censored, reordered and even less comprehensible version played U.S. theaters. "Strange indeed" is how the Chicago Daily Tribune reviewed it. Given the mass shrug greeting "Beat the Devil," how did it grow into a cult favorite, long before the latest restoration? Partly, it was due to a handful of critics (notably Pauline Kael) who responded to the movie's blithe artificiality and brazen indifference to playing by normal rules of screenwriting. Last year, Sony Pictures' Crisp headed the restoration of "Beat the Devil," partnering with the Film Foundation and other funding sources. "There are two kinds of restorations," he says. "One makes the film look as good as possible. The other is when the film, sadly, is in disarray, and is either deteriorating or pretty badly damaged, as this film was. There were parts missing. Our U.K. distributor came up with some missing footage, and the version they found in a vault in London was a revelation. It had all this other material in it, four minutes' worth. And that version told us, effectively, how we should put it all back together." Result: The new introductory scenes focus on Jones' character in an intriguing way. The Bogart narration vanishes. The flashback structure is no more. Certain sexual aspects of the so-called storyline come through more clearly now, including dialogue about Jones waiting for Bogart to make a pass at her, and a rhyming scene (the movie tiptoes up to a double infidelity) featuring an outrageous shot of Lollobrigida's cleavage, unseen by U.S. audiences in 1953. Fans and detractors of "Beat the Devil" can probably agree: Huston's movie was more fun to make than it was to watch. The shoot never stopped stumbling. One night, Huston fell off a cliff, a 40-foot cliff, and somehow didn't hurt himself. Bogart messed up his teeth in a car accident. The movie in progress became a party. Famous people dropped by for a few days, drank, made merry and left again. The young, unpaid clapper boy on the shoot was always playing piano when he could; his name was Stephen Sondheim. "He liked to tinkle away on the out-of-tune piano in the hotel," recalled script supervisor Angela Allen, years later. "I said, 'I think that young man is going to go a long way.' And everyone told me how stupid I was." Like Orson Welles' "The Lady From Shanghai" a few years earlier, "Beat the Devil" bent and stretched audience expectations to the snapping point. This is why it works so weirdly well for some people today, especially in this 4k restoration. "When I saw it this time," says the Film Center's associate programming director Martin Rubin, "I saw it very much as a postwar atomic age film. The world's a mess, it's all going to blow up, so anything goes. There's a playful nihilism in it. And it's so self-referential. The way these characters are trying to put together their uranium scheme is like Huston and Capote trying to put together 'Beat the Devil,' right there on the spot." "Beat the Devil," June 30-July 5, Gene Siskel Film Center, 164 N. State St.; www.siskelfilmcenter.org.